Like many people, my husband and I rely on vitamins to help ensure that our daily nutrient needs are being met. We each take our own multi-vitamin, as well as additional vitamins and supplements. 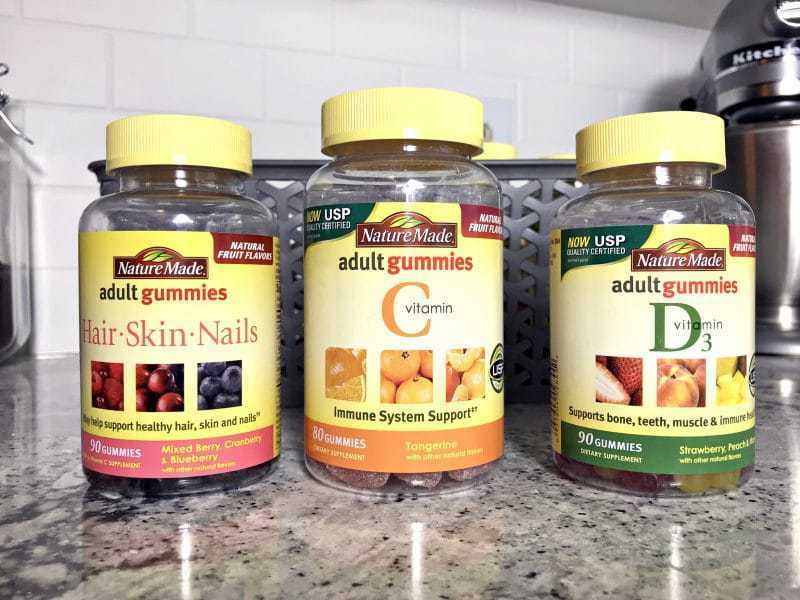 Although the specific vitamins we each take may differ, one thing we agree on is that Nature Made® Adult Gummies are our favorite brand of vitamins. Not only are Nature Made® Adult Gummies tasty, but they are also very convenient. No need for a glass of water to take your vitamin with, you can simply chew the gummies. Nature Made® Adult Gummies are the first gummies to receive verification from the U.S. Pharmacopeia Convention (USP), a third party nonprofit organization that verifies products for purity, potency, and quality. This third party certification verifies that Nature Made® Adult Gummies contain the nutrients that they claim to on their label. Learn more about Nature Made® and USP here. Nature Made® Hair Skin & Nails Adult Gummies provide 2500 mcg biotin and 100 mg vitamin C per serving and come in delicious Mixed Berry, Cranberry and Blueberry flavors. These Gummies are the only Beauty Gummies that are USP verified, so you know that what’s on the label, is what’s in the gummies. Since discovering Nature Made® Adult Gummies I actually look forward to taking my vitamins each day. They have transformed taking vitamins into what feels like enjoying a delicious treat. However, with my husband and I taking multiple vitamins per day, the bottles add up. We like to keep all of our vitamin bottles in sight so that we remember to take them each morning. This is how all of these vitamin bottles ended up all lined up on our kitchen countertop. 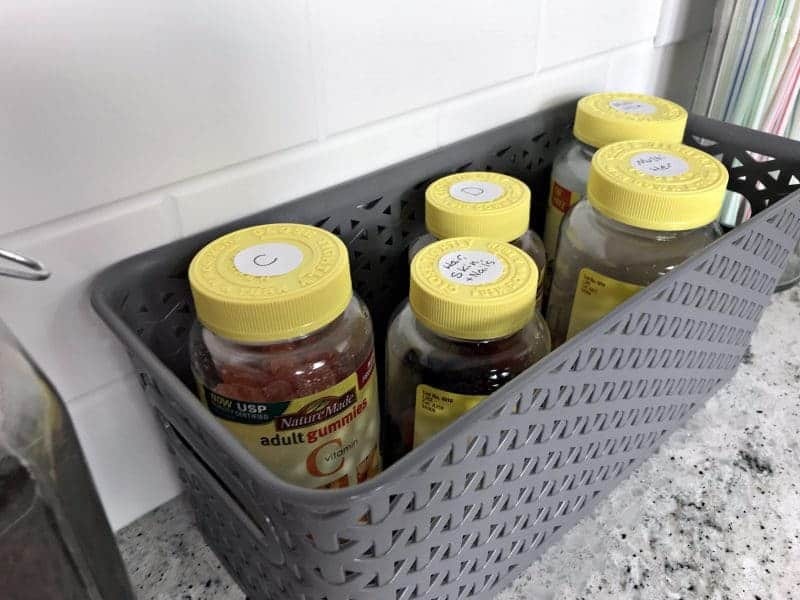 While I like having our vitamins right where we will see them each morning, I set out to find a better and more organized way to store them. Below you will find my tips for vitamin organization, as well as a helpful weekly vitamin schedule printable. 1. Gather all your vitamins. Be sure to through your medicine cabinet, kitchen cabinets, kitchen counter, and anywhere else that you keep your vitamins. Pull them all out and place them all in once place. Check the vitamin bottles one by one for their expiration date. Discard any vitamins that have expired. 3. Label the top of vitamin bottles. 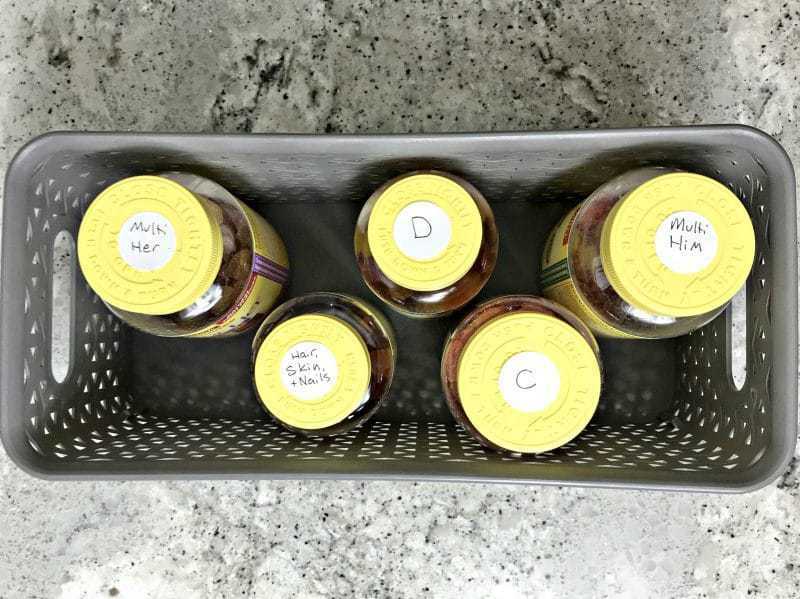 Label the top of each vitamin bottle so that you can easily identify them from above. This way it is easy to grab the vitamins you are looking for without having to move around all the bottles to read their labels. 4. Place vitamin bottles in a bin. Take all your remaining vitamins and place them in a storage bin. 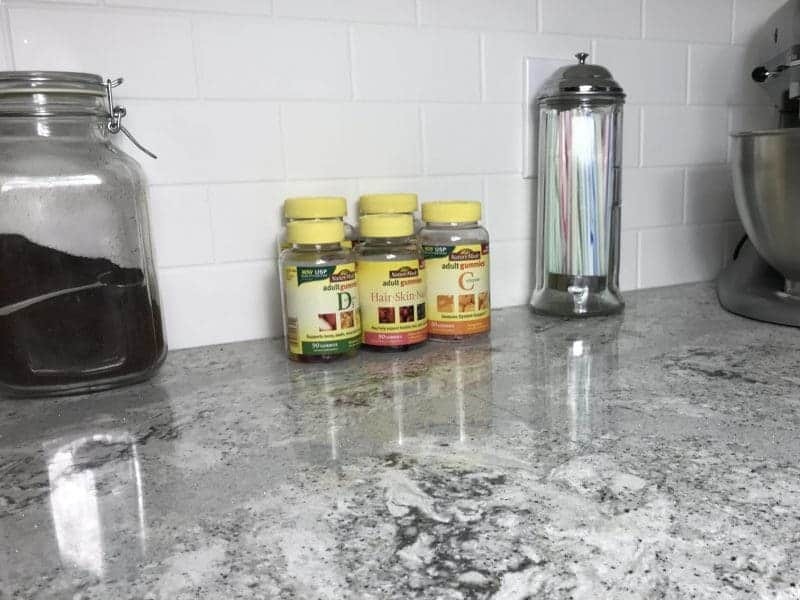 Look for a bin that goes well with your kitchen decor if you are like me and like to keep your vitamins out on the kitchen counter so that you have the visual reminder to take them each morning. Or, if you would rather keep your vitamins in a kitchen cabinet, it doesn't matter as much what your storage bin looks like. 5. Follow a vitamin schedule. Certain vitamins should be taken in the AM, others in the PM, and yet others with a meal. When you take several different vitamins, it can become difficult to keep track. 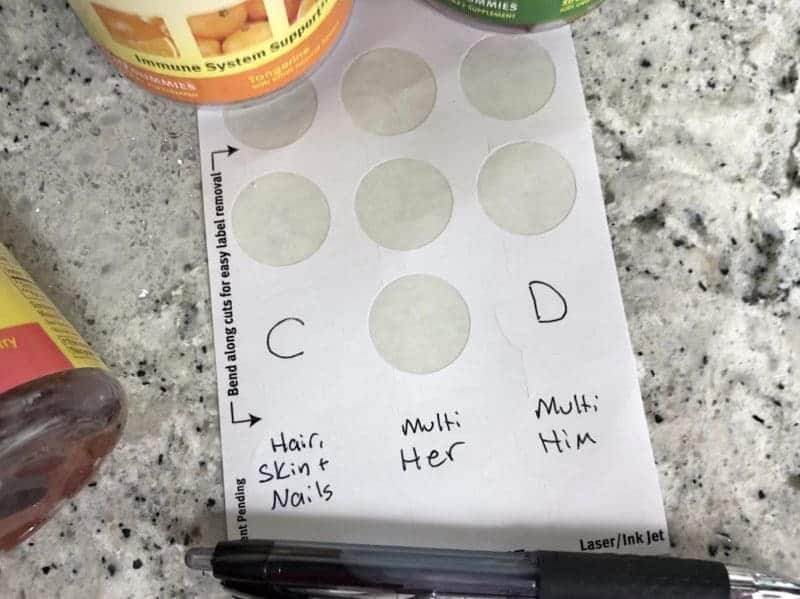 My husband and I struggled to keep track of which vitamins to take when. 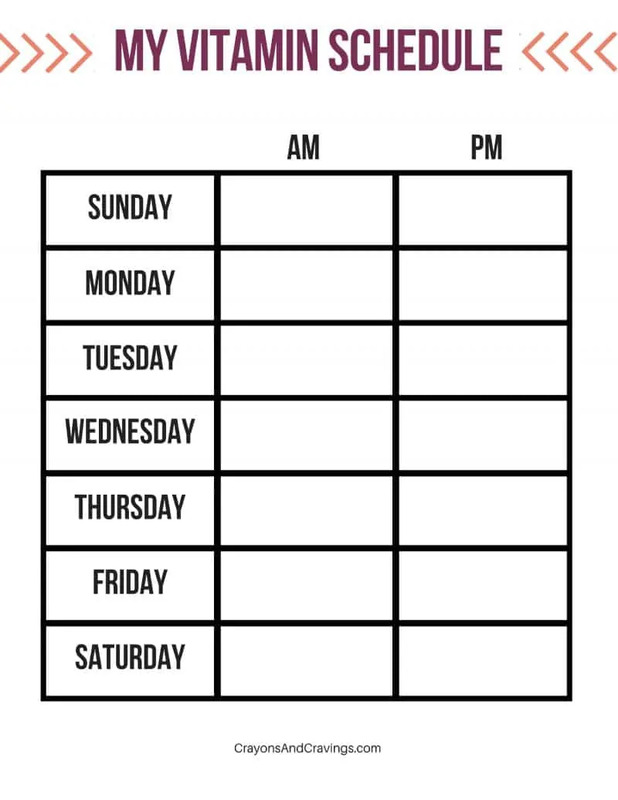 To make it simple, I designed a weekly vitamin schedule that I can print out for each of us each week. Using the vitamin schedule has been a great way to make sure that we both remember to take all of our vitamins. You can print out a copy of the weekly vitamin schedule here. 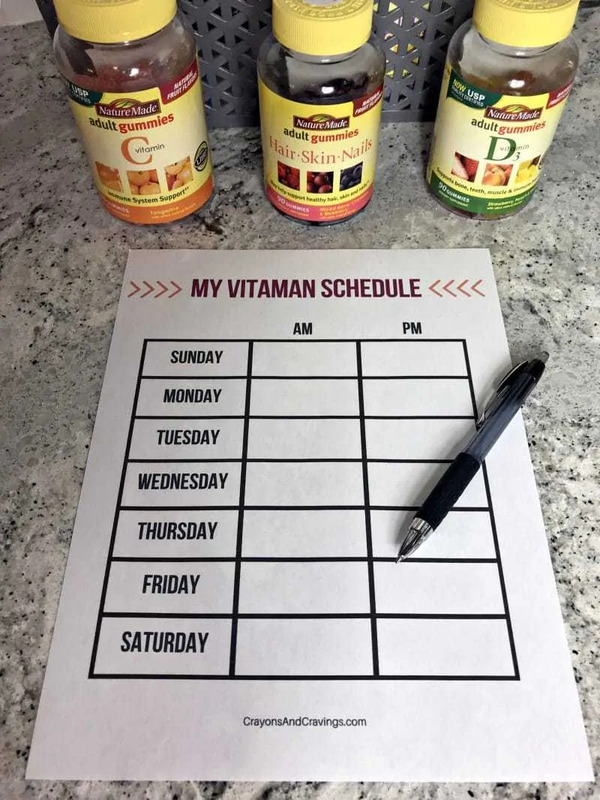 Then, reference the directions on your vitamin bottles to find out when each of your vitamins should be taken, and fill in the printable vitamin schedule accordingly. Since taking the time to organize our vitamin bottles, finding a particular vitamin bottle, as well as moving the bottles, is much easier. Storing all our vitamin bottles in a bin allows me to easily lift up all of our vitamins all at once to wipe the countertop underneath them. 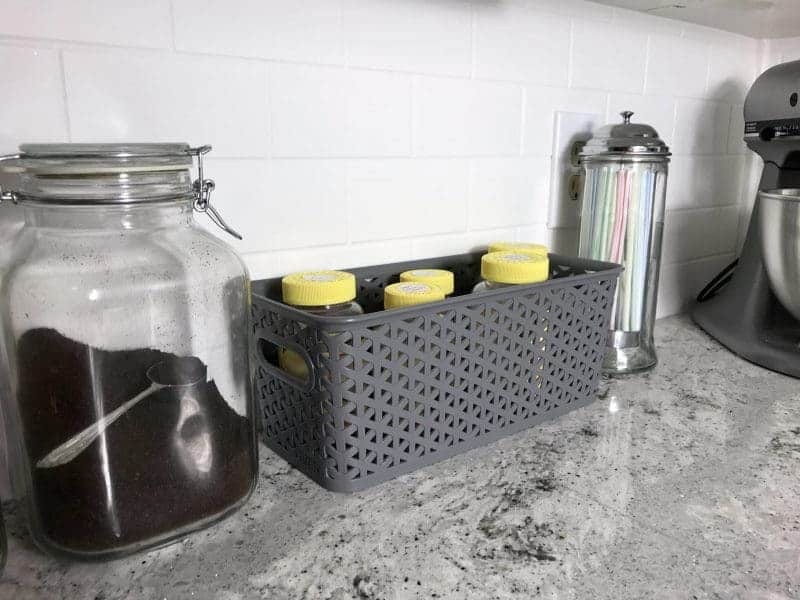 Plus, having all our vitamins in a decorative storage bin simply looks makes our kitchen look better and more organized. I hope that these tips help you with your vitamin organization and storage as well. Happy organizing! This is genius!! I am always forgetting when and if I took my vitamins and supplements!! Plus I never know which ones to take with food and so on!! I think keeping your medicine organized is a great thing to do. Great advice. I so need to do this since I can’t always remember. I could use a schedule. I am always forgetting which vitamins I have taken. Organization is definitely helpful. 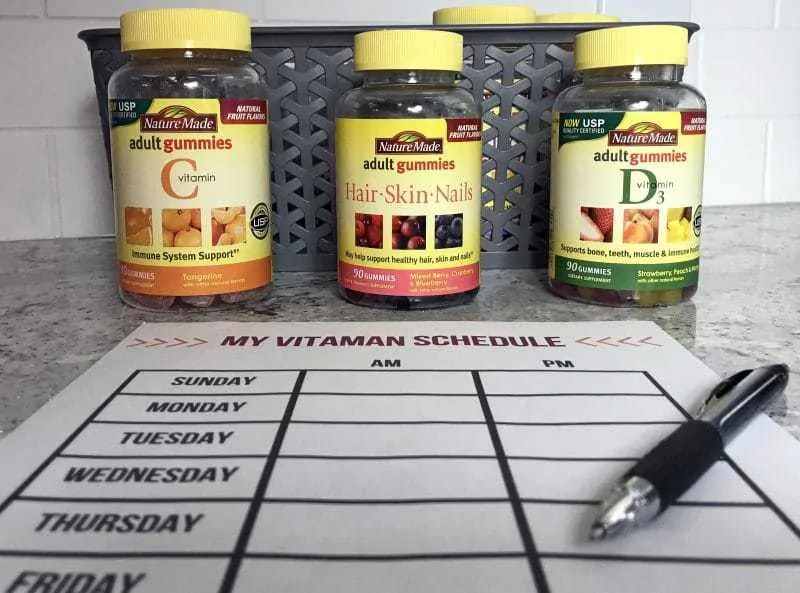 I take a ton of vitamins and am always looking for ways to keep them organized. Thanks for sharing this! You could also write a.m. or p.m. on the label on the top to help remember when to take what. I keep mine in a bread box on my counter top that way my vitamins are hidden away and goes well with my kitchen decor. And I also use one of those week long pill organizers and refill them once a week so I won’t forget to take them. Yes, I use a pill box too. Much easier and faster than opening a bunch of bottles every day. I take prenatal nature made while pregnant with my third baby. I also took them with my second daughter was in the womb.